The Netflix series The Who Was? Show has an episode devoted to Marie Curie and Houdini. It's high energy and pretty fun. 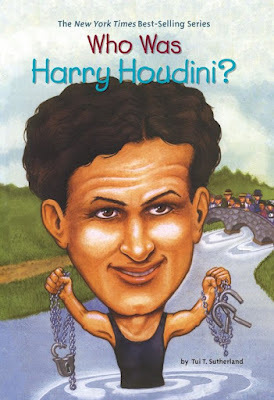 I especially like the folk singers who only sing songs about Houdini's life. Houdini is played by Zach Timson and Bess is played by Lilla Crawford. Watch The Who Was? Show Season 1, Episode 8, Marie Curie & Harry Houdini on Netflix. The Who Was? Show is based on the New York Times bestselling children's book series. Their Houdini volume was released in 2002 and is still available on Amazon.